1. 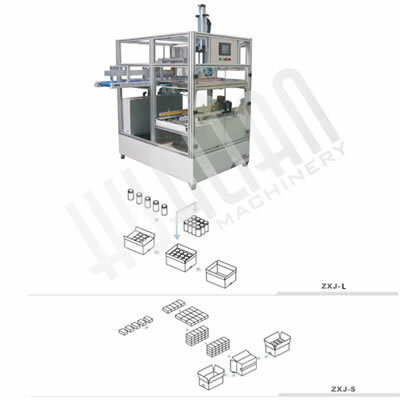 Vertical automatic encasing machine ZXJ-L can automate the process to put the lined-up inner packing container into carton/case in plumb direction. We also design a suited line-up conveyor according to specifications and lining requirements of the package to match with encasing machine. 2. Horizontal automatic encasing machine ZXJ-S can put the lined-up inner packing container into accumbent carton automatically in horizontal direction. The company can design a suited line-up conveyor according to specifications and lining requirements of the package to match with this encasing machine. 1. Vertical automatic encasing machine ZXJ-L is suitable for dispersed package or grouped package, or products encasing to either round or un-round container. 2. Horizontal automatic encasing machine ZXJ-S is suitable for cases in symmetrical shape, such as round shape, square shape etc. As a professional automatic encasing machine manufacturer in China, we have been manufacturing automatic encasing machines and other packaging machines since 1989. We know that quality is of the highest importance to a company. To ensure the quality, we introduce advanced manufacturing technology from American and European countries, purchase advanced manufacturing equipment and inspection equipment, and designate special inspectors to supervise every production process. As a result, all of our packaging machines are qualified and CE certified. Meanwhile, we have also obtained ISO9001:2000 certification. Located in Wenzhou City in Zhejiang Province, we are surrounded by highways, airports and sea ports. This will help reduce your transportation cost. Please contact us if you intend to cooperate with us.